I think it’s going to be ‘Comfort Food’ weather for quite some time in East Yorkshire. Spared from the ravages of rain and high seas that the rest of the UK has suffered since Christmas, we should be thankful, but it’s still a bit damp and grey and soggy in Hornsea. Looking for some inspiration food-wise, I discovered this Cauliflower, Bacon and Mustard Gratin Recipe from the Good Food Channel. Basically it’s a vegetable gratin or bake, but with pancetta to give it some added flavour. The addition of crispy focaccia breadcrumbs and sunflower and pumpkin seeds means that this recipe sounds crunchy, healthy and incredibly tasty on a dull January afternoon. This Cauliflower, Bacon and Mustard Gratin recipe sounds perfect for a weekday meal, and with the addition of sunflower and pumpkin seeds, and focaccia crispy crumbs, it will be reasonably healthy and delicious to eat. You could add a mixed winter salad, with baby spinach leaves, watercress, rocket and some radishes for colour, and that would really fill you up. I would happily serve this to friends as well for a relaxing meal. Looking forward this - real comfort food. Preheat the oven to 200C / 180C fan /gas6. Plunge the cauliflower into a pan of boiling water, bring back to the boil and cover and simmer for 5 minutes. Drain very thoroughly. Grease a good-sized dish suitable for roasting, then arrange the well-drained cauliflower in it and set aside. Melt the butter and flour together in a pan and cook, stirring over a low heat for 2 minutes. Remove the pan from the heat and gradually blend in the milk, stirring all the time until thickened. Add the mustard and cream cheese until well blended, taking care it does not catch on the heat. Remove from the heat and allow to cool slightly. Heat the oil in a large frying pan an cook the pancetta for 5 minutes. Add the breadcrumbs and cook for a further 5 minutes, stirring and scraping up any juices, until crisp and golden. Remove from the heat and allow to cool. Stir in the lemon rind, seeds and cheese. Pour the sauce over the cauliflower to cover it well, and then scatter over the breadcrumb mixture. Bake for 25 - 35 minutes until golden and piping hot and ready to serve. 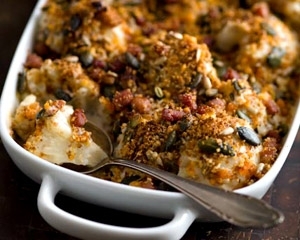 Really looking forward to this Cauliflower, Bacon and Mustard Gratin recipe this week. It just sounds such a comforting,vegetable bake, but with the addition of pancetta, focaccia crispy breadcrumbs and both sunflower and pumpkin seeds, Erik and I will be full of energy and very happy as well. Enjoy.